Screenshot of La Pulla’s episode “Pablo Escobar is a Hero,” available on YouTube. The phenomenon didn’t start with the Netflix series, but Narcos certainly helped revive 1980s Colombian drug lord Pablo Escobar’s status in North American popular culture. Since it premiered in 2015, the controversial series has fueled conversations about Colombia’s persistent international image as a cocaine paradise dominated by charismatic drug traffickers. 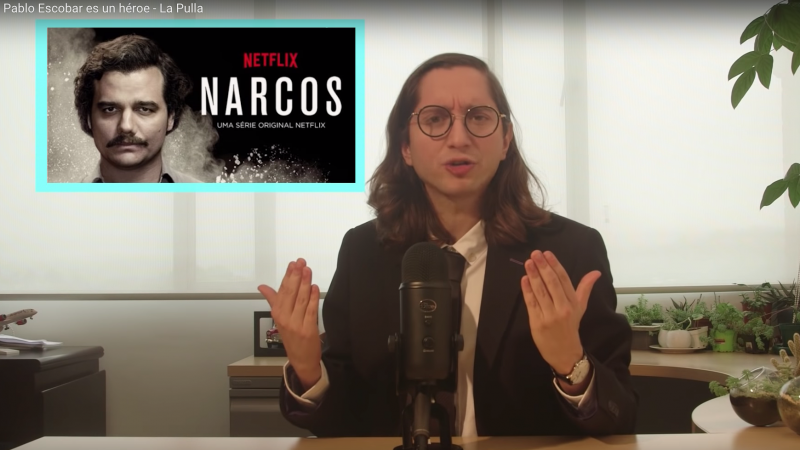 As a response, the Colombian journalists behind YouTube channel La Pulla (in Spanish, “the taunt”), a project by Colombian newspaper El Espectador, made a video responding to people who still glorify Escobar as a “hero”. Among other things, the video highlights tragic episodes — and statistics — of one of the darkest periods of Colombia’s history, such as the assassination of El Espectador’s former director Guillermo Cano on December 17, 1986, and the bomb attack next to their offices in September 1989. It is common in other countries to see people with T-shirts of him, encouraged by series such as Netflix’s ‘Narcos’. And then when they come to Colombia they pay a lot of money to go on a tour so they can admire his great accomplishments. […] This “hero” prompted thousands of people to run towards drug trafficking money [like] pigeons chasing corn and rendered the national economy into a little pot to launder the money that came from drug trafficking. This “hero” was not a friend of the people: he committed 623 attacks, left 1710 civilians in pain, and killed 402. This “hero” forced us to escape from an abandoned briefcase in the street or from a stationed car with no one inside [thinking] there [it was] one more bomb. This “hero” forced us to stay indoors, to suspect from everyone, and to react with fire and violence. This hero forced us to live in constant fear. The tours referenced in the video are known as Narco Tours, and they guide tourists around the city of Medellin through famous spots related to Pablo Escobar’s life. In 2018, Global Voices partner Radio Ambulante described the tour in one of the episodes of their award-winning podcast.